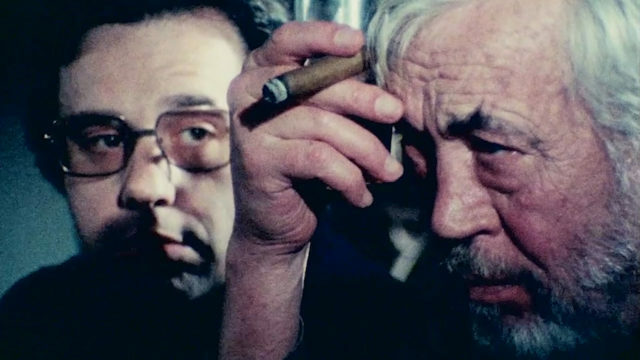 Orson Welles' THE OTHER SIDE OF THE WIND is a mess. There are some brilliant moments in the film, and it kind of falls together as it goes on, but it's "attack" Hollywood doesn't really amount to much. The film is supposed to be a kind of found footage film of the last night in the life of a famed director who died in a car crash. The footage was shot by all sorts of fans and press who were invited to his birthday party where the titled film, his latest project still unfinished due to the lead actor walking off, would be screened for them. The film attempts to lay waste to the studio system, film fans, sycophants, actors, European films and everything else that was annoying Welles. I honestly don't know what to say about the film because after a single viewing I really haven't gotten a handle on it. I know that people who have seen the companion film THEY'LL LOVE ME WHEN I'M DEAD have liked it more because that film acts as a keystone for understanding OTHER SIDE. Seeing it without the keystone the film is a jumble of ideas and scenes that work in fits in starts but never fully come together. I've been told that Welles was trying to bash European cinema of the late 60's but I don't think it worse since the film plays as a kind of American riff on 8 1/2 with a perfect aping of the style. If it's a bash it doesn't work because one of the things I really liked was Welles aping of the style to make a film that wasn't entirely his style. The problem with the film is it is a lot of clips and snippets of conversations that kind of tell the story of the party and the attempt to figure out how to finish the film. The problem is some pieces are better than others as are some of the performances. You can tell that bits were pulled from all through the years long shooting since Rich Little keeps showing up in scenes. For those who don't know Little was originally cast in Peter Bogdanovich's role so his appearance becomes a tad surreal. I do have to say that as much as the film is a mess, I do weirdly like it. There is an intelligence at work and the film is clearly an attempt to be about something. Yes it is frozen in the late 60's early 70's sensibilities but at the same time there is a genuineness to it. There are also some wicked exchanges and discussions that are raw and naked and very funny. Is the film worth seeing? Yes. More so if you can see it on a big screen where the aspect ratio changes can really be felt. Just remember that the film is more an interesting footnote than a lost masterpiece. Honestly, cast aside, had this not been an Orson Welles film we would never have seen this at all.